When Ohio State and Notre Dame meet in the 2016 Fiesta Bowl on New Year’s Day, it will be a battle of two of the most successful programs in the history of college football. The Buckeyes and Fighting Irish are both among the five winningest programs of all time, with more than 1,700 victories between the two schools. As has been widely circulated this week, Ohio State and Notre Dame have met five previous times, with the Buckeyes holding a 3-2 series edge, and winning all three meetings in the modern era. Herein, we’ll take a look back at those five prior meetings and delve into the rich history of the series, which consists of surprisingly few contests between a pair of universities less than 230 miles apart. The series began with a home-and-home set of games in the 1930s. Long before Ohio State and Michigan met in the “Game of the Century” of 2006, the Buckeyes and Irish met for the first time in their own such contest, back on Nov. 2, 1935. Notre Dame came to Ohio Stadium with a 5-0 record. The Buckeyes were 4-0, with wins over Kentucky, Indiana, Northwestern and an 85-7 shellacking of Drake. Ohio State hadn’t allowed more than seven points in any game and only Kentucky held the Buckeyes to fewer than 28 points (19). 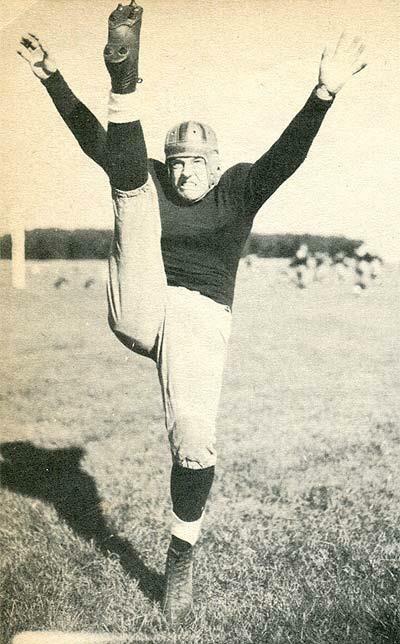 Irish coach Elmer Layden used the media to fire up his team, telling reporters Ohio State would probably score at least five touchdowns on his defense. Layden appeared to be onto something when Ohio State scored early. Frank Antenucci intercepted a pass from Layden’s younger brother Mike — Notre Dame’s quarterback — and, after a 10-yard return, lateraled to Frank Boucher, who took it the rest of the way, giving the Buckeyes a 7-0 lead. Joe Williams made it 13-0 with a three-yard rushing touchdown before halftime. Bill Shakespeare sunk Ohio State in the first meeting. After a scoreless third quarter, the wheels fell off for Ohio State. Andy Pilney returned a punt to the Ohio State 12 on the final play of the third period. Then fullback Steve Miller scored from the 2-yard line a couple of plays later. Miller nearly scored on Notre Dame’s next possession, but fumbled into the end zone. Ohio State punted again and the Irish scored on a Pilney 15-yard pass to Mike Layden, cutting the OSU lead to 13-12 with less than two minutes to play. Ohio State tried to run out the clock, but fumbled the ball out of bounds. Because a fumble out of bounds was awarded to the last team to touch the ball back in those days, Notre Dame got the ball back. Irish backup quarterback Bill Shakespeare (!) hit Wayne Millner in the waning seconds to give Notre Dame a shocking 18-13 win in Columbus. The Buckeyes finished 7-1 in 1935, with one bad quarter against the Irish spoiling a perfect season. The return leg in 1936 took place in South Bend, Indiana, but Ohio State was only 2-2 entering the contest. The game took place on Halloween in front of more than 50,000 fans — a record at the time for Notre Dame Stadium. The Fighting Irish won 7-2 in a driving rain storm. The Buckeyes drove to the Notre Dame 12-yard line late in the game but again became victims of the game’s rules of the time. Nick Wasylik threw two straight incomplete passes into the end zone. At the time, two consecutive incompletions in the end zone resulted in a touchback and the Irish took possession. Ohio State players argued to no avail that the ball had struck the ground before it reached the end zone, but the officials disagreed. Darkness in the gloomy weather as evening descended may have played a role in that. Ohio State had to wait almost 60 years to get its first win in the series. The Irish visited Ohio Stadium in 1995. I was in the stadium that day, on Sept. 30, 1995 — just 16 days after my 29th birthday. More than 95,500 others were there with me that day. Lou Holtz stalked the Notre Dame sideline in a neck brace, after undergoing back surgery a couple weeks earlier. Holtz’s troops took an early 10-0 lead early in the second quarter behind Kevin Kopka’s 20-yard field goal and a 3-yard run by Randy Kinder. The Buckeyes responded with a 10-yard pass from Bobby Hoying to Terry Glenn, but the Irish answered right back with Kinder’s second touchdown run. With just 44 seconds remaining in the first half, Hoying hit Dimitrious Stanley from 17 yards out to make it 17-14. Notre Dame got another Kopka field goal to go ahead 20-14 early in the third, but by that time the Buckeyes were rolling on offense. Hoying hit Rickey Dudley from 15 yards out and Glenn had an 82-yard catch and run on a slant pattern to give the Buckeyes a 28-20 advantage before the end of the third. The Irish were chasing Eddie all day in 1995. Eddie George carried in from the 5-yard line on the first play of the fourth quarter to make it 35-20. Kinder cut the lead to 35-26 with his third touchdown of the day just two minutes later, but the two-point try failed. George tacked on another touchdown and Josh Jackson connected on a 35-yard field goal for the final margin of 45-26. George rushed for 207 yards and Ohio State racked up 533 yards of offense, with Hoying throwing for 272 yards and four scores. Ohio State won its first 11 games that season, but, as was typical of the John Cooper years, a loss to Michigan derailed a potential national championship season and the Buckeyes lost to Tennessee in the Florida Citrus Bowl to finish at 11-2. The teams met again in South Bend in 1996, on Sept. 28. The Buckeyes looked like a juggernaut after beating Rice, 70-7, and Pittsburgh, 72-0. Notre Dame on the road would present the first real challenge, however. It took only 1:45 for Ohio State to jump on top. Stanley returned the opening kickoff deep into Notre Dame territory, and Pepe Pearson ran it in from four yards out to make it 6-0. The PAT failed. The Irish took a 7-6 lead in the middle of the first quarter, when Ron Powlus hit fullback Marc Edwards with a two-yard pass. Just minutes later, however, the Buckeyes took a page out of Notre Dame’s book when Stanley Jackson found fullback Matt Calhoun with a two-yard touchdown pass of his own. The two-point try failed, and Ohio State carried a 12-7 lead into the second period. Late in the second quarter, the Buckeyes stalled deep in Irish territory and had to settle for a 24-yard Josh Jackson field goal. Minutes later, Ohio State seized control on a one-yard plunge by Pearson, grabbing a 22-7 advantage just before the break. Notre Dame hit a short field goal early in the third to cut the lead to 12, but got no closer. Stan Jackson hit D.J. Jones with a 13-yard touchdown pass late in the third to make it 29-10. Edwards scored on a nine-yard run midway through the fourth. The PAT was blocked and Notre Dame could pull no closer, falling 29-16. Ohio State had evened the all-time series at 2-2 and Cooper had won his 150th game as a collegiate head coach. Emulating George’s big day the year before, Pearson ran for 173 yards and two scores on 29 carries. Jackson went 9/15 for 154 yards and two touchdowns and Joe Germaine connected on 4/5 for 31 yards. That team could have won the national championship too, if not for a 13-9 home loss to Michigan. Those of you who have only been around for Tressel to Fickell to Meyer have no idea what those years were like. At least those Buckeyes did bounce back to win the Rose Bowl over Arizona State and finish 11-1. The most recent meeting, of course, was in the 2006 Fiesta Bowl. I’ll tell you more about that 34-20 win — which wasn’t as close as the score indicates — soon. A BCS bowl win like that deserves a column of its own.